The Great Lakes Fishery Commission has had tremendous success in controlling sea lampreys in the Great Lakes. The commission uses science-driven innovation to find the best, most cost-effective ways to deliver its control program. 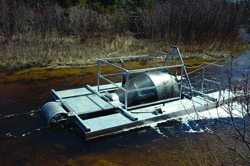 Enhancing existing and developing new control techniques is critical to keeping the program current and effective at stopping the noxious sea lamprey. An effective pest control program is integrated, meaning it relies on several techniques to attack the problem from many different angles. Accordingly, the Strategic Vision for the Great Lakes Fishery Commission 2011-2020 (pdf) outlines a series of goals and strategies for improved sea lamprey control through the assessment and deployment of new tactics and technologies. Why go beyond lampricides if they work? The lampricides TFM and Bayluscide remain the workhorses of the program because they are enormously effective, selective, and do not harm the environment. Nevertheless, lampricides are expensive and, worldwide, used only by the commission—resulting in a vulnerability if supplies are disrupted. Moreover, sea lampreys could develop resistance to lampricides or adopt behaviors that render them less susceptible to the effects of lampricides. What is the commission's vision for the future? The sea lamprey genome has been sequenced, providing an understanding of the genes that determine the animal's behavior and physiology, such as migration, mating, and responses to danger and environmental stressors. This monumental achievement will allow scientists, for years to come, to perhaps customize control techniques to exploit points of weakness that interrupt the sea lamprey's life cycle. No other aquatic pest control program has this advantage, and the commission is intent on using genomic knowledge to develop innovative tools and tactics for suppressing sea lamprey populations. 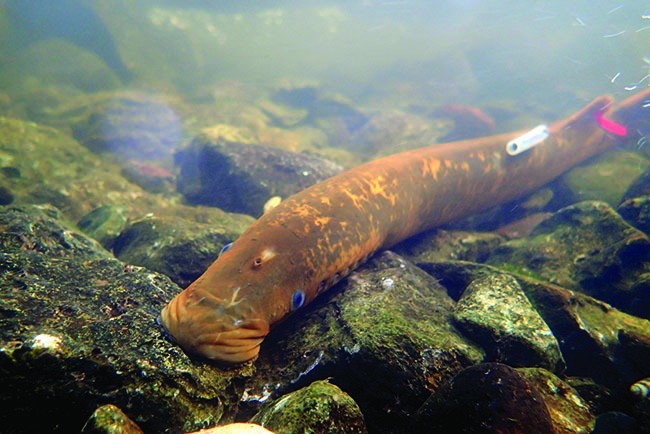 Understanding the potential of sea lampreys to develop TFM and Bayluscide resistance, as well as developing the next generation of lampricides, is another high priority. TFM has been safe and effective in controlling sea lamprey populations in the Great Lakes basin for 60 years. Using data provided by the genome project and related studies, scientists will determine if sea lampreys are becoming less susceptible to TFM and will evaluate proactive measures and strategies to prevent or mitigate lampricide resistance. Moreover, with a greater understanding of sea lamprey biology and life-history—which is certainly more robust than decades ago when TFM was first discovered—the development of a potentially less expensive, even more effective lampricide is a realistic objective. Influencing sea lamprey behavior, primarily during migratory and mating periods, through the use of pheromones and alarm cues—natural odors used by sea lampreys to communicate—is another central theme of the sea lamprey research program. Pheromones could be used to guide sea lampreys to areas that can be treated effectively with lampricides or into traps (i.e. pull). Alarm cues, by contrast, may be used to prevent sea lampreys from entering streams or areas that are difficult to treat or trap (i.e. push). Using both types of signals in concert as "push-pull" techniques could provide synergistic benefits beyond the use of a single signal. 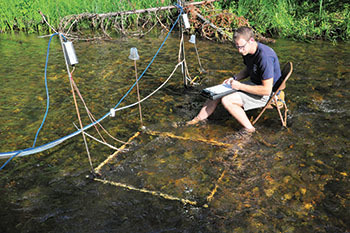 Interrupting the migration of sea lampreys—either as downstream-migrating parasitic juveniles that have recently metamorphosed from larvae or as upstream-migrating adults—by diversifying and improving the network of barriers and traps is another strategy that could improve sea lamprey control. This strategy is attractive not only because it involves blocking adults from thousands of miles of suitable reproductive habitat, but it also addresses the removal of parasitic juveniles before they enter the lakes to feed on fish. As the issue of restoring the natural flow of aquatic systems gains momentum, the commission and its partners are committed to developing a cohesive process for proposing, evaluating, and implementing barrier construction and removal projects. The commission believes such projects must incorporate designs to stop invasive species, protect species at risk, prevent the movement of contaminants and disease, facilitate the passage of native migratory species, and improve recreation. Improvements in barrier design and trapping will help the commission meet these objectives. Innovation never stops at the Great Lakes Fishery Commission. The commission and its partners have created an ambitious vision for the future of sea lamprey control that may take decades to achieve—but the potential payoff of any one of these techniques could be huge. Thanks to the commission's science program and the Great Lakes Restoration Initiative, major advances in new control methods have occurred. As soon as new techniques have been field-tested and proven to be effective, they will be deployed in the field.